Savannah, Ga - The Clovers look to avenge their 4-2 loss earlier in the season to Soda City FC today at Memorial Stadium. The pivotal match features the top two teams in the UPSL Southeast Mid Atlantic Division. Soda City FC has maintained the top of the table for the entire season. With a win today, the Clovers can claim top spot in the Division with 2 games left in the regular season. Soda City FC sits on 16 points with 5 wins so far this season, only dropping points in their last game against Union FC. After dropping two road games, the Square City Club has won back to back games heading into today’s match. Be sure to join us today at Memorial Stadium for a great evening of soccer. Wear your green and cheer on the Clovers! CFC2 V MIDDLE GEORGIA KNIGHTS @ 4:45 PM EST. 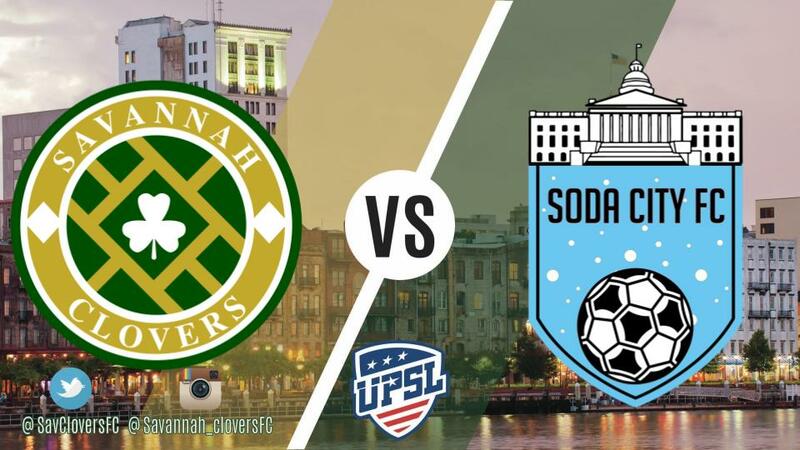 SAVANNAH CLOVERS V SODA CITY FC @ 7:30PM EST.